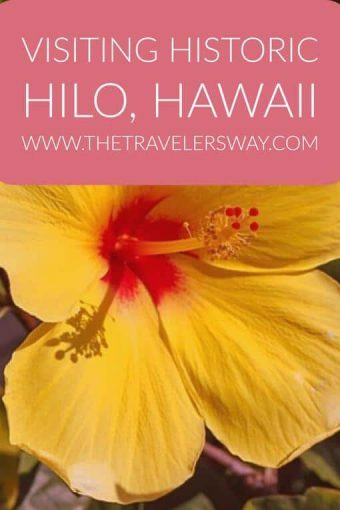 When I first learned I’d be visiting Hilo, on the east side of Hawaii’s Big Island, I knew very little about the city. Once I arrived, though, I learned that Hilo has a rich history and the people living there are enthusiastic about sharing it with visitors. 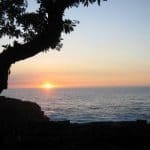 The Big Island is where Captain Cook first landed and “discovered” the Hawaiian islands back in 1778, and it was also the island where the monarchs and ruling chiefs had many conflicts over power. Today, Hilo is the second largest city in Hawaii, behind Honolulu. 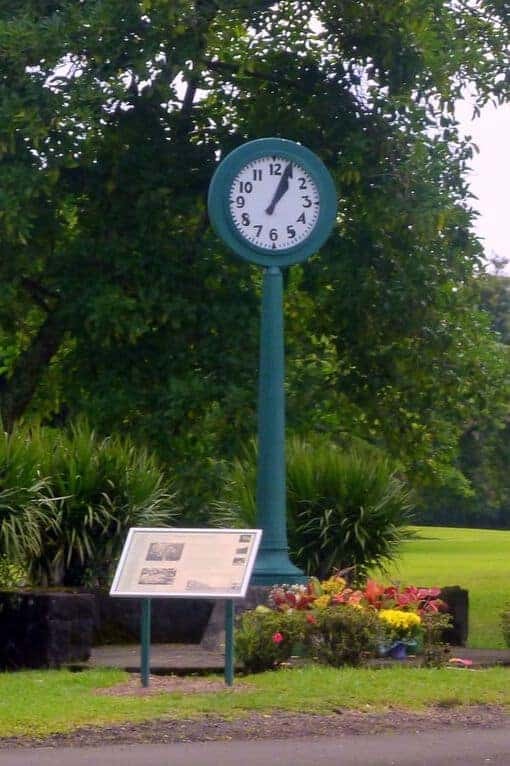 As one islander said, “time stands still in Hilo,” both literally because there is a clock that is frozen at 1:05 a.m. from when a tsunami hit on May 23, 1960, and also because the city has maintained its charm. Hilo isn’t overrun with chain hotels and resorts, and locally owned restaurants outnumber chains. 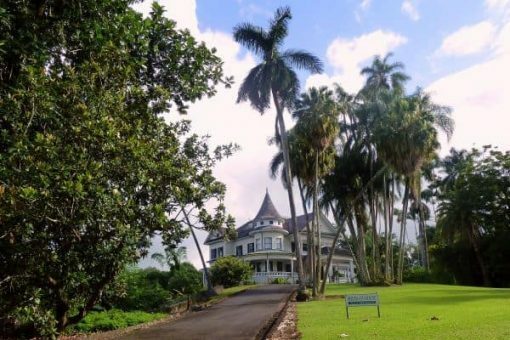 But more than that, Hilo is full of historical sites that will give you some insight life in the islands, and also caution you about why we need to appreciate the power of Mother Nature! Tsunami memorial clock, which stopped at 1:04 a.m. when the tsunami hit on May 23, 1960. 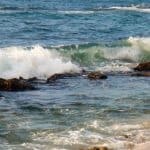 Because of their location in the Pacific Ocean, the Hawaiian Islands are susceptible to tsunami waves resulting from earthquakes pretty much anywhere along the Pacific Ring of Fire. The main purpose of the Pacific Tsunami Museum is to remember the devastating tsunamis that have hit Hilo and to educate people so that lives can be saved and damage can be more limited when the next big wave hits. The Tsunami Museum building itself is a historical landmark. Housed in what used to be the First Hawaiian Bank, the movie room is in the old bank vault. The bank was originally built in 1930, and First Hawaiian Bank donated the building to the museum in 1997. When I was at the museum a survivor of one of Hilo’s big tsunamis was visiting along with his family. Survivors will sometimes lead tours through the museum or give talks or special presentations giving a chilling reminder to how real the danger is. Pick up a pamphlet at the museum of the East Hawaii Driving & Walking Tour of Historical Tsunami Sites. The driving tour takes about 3 hours and the walking tour around 90 minutes. Visitor information: The Pacific Tsunami Museum is located at 130 Kamehameha Ave. Hours: Monday-Saturday 9 a.m. to 4:15 p.m. General admission is $8, Seniors & residents $7, Children ages 6-17 $4. In the early 1800s, missionaries began working in Hawaii to convert Hawaiians to Christianity. David and Sarah Lyman were a missionary couple from New England who came to Hawaii during this period, and their house, built in 1839, is the oldest standing wooden structure on the Big Island. Known as the Mission House it shows visitors what life in Hilo was like in the 1800s without electricity or running water. The Mission House features furniture, tools, household items and artifacts used by the Lyman’s, and is open to the public by guided tour only. The museum building next to the Mission House containss artifacts, fine art, and natural history exhibits, and is on the State and National Registers of Historic Places. 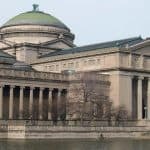 There is also the Lyman Museum Archives that includes historical documents, books, and photographic collections, and is open by appointment only. Special note: When King Kamehameha ascended to the thrown in 1825, he became Hawaii’s first Christian ruler. Visitor information: The museum is located at 276 Haili Street. Hours: Monday-Saturday 10 a.m. to 4:30 p.m. Admission is $10, Seniors $8, Children ages 6-17 $3. Reduced rates for Hawaiian residents. The Federal Building (and U.S. Post Office, completed in 1917, was one of the first buildings in Hawaii to be constructed with permanent materials. It has features common to Mediterranean Renaissance Revival architecture, such as Tuscan columns supporting the two-story colonnade and the decorative elements in the courtyard, and was added to the National Register of Historic Places in 1974. Apparently, it can also be the site of protests, as people were holding signs exclaiming “Stop the War!” and “Teach Peace!” when I drove by! Visitor information: The Federal Building is located at 154 Waianuenue Avenue. The Shipman House Bed and Breakfast is like a museum you can sleep in. This beautifully restored Victorian home was one of the first houses in the country to have electricity. Owners Barbara and Gary Andersen, Barbara is a descendant of the original Shipman family, are quick with interesting stories about the family and home. You can stay in the same room that Jack London and his wife stayed in, or play the 1912 Steinway Parlour Grand B piano that Hawaii’s last monarch, Queen Lili`uokalani played. I recommend Auntie Clara’s room if it’s available. The view is one of many shades of green rainforest trees with a peek at the Hilo Bay over the treetops. You can hear the creek running down to the river and the sounds of birds during the day and the coqui frogs at night. 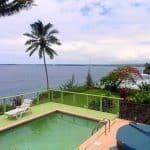 It’s hard to believe that downtown Hilo is a quick drive or 10 minute walk away. Enjoy the morning breakfast by trying two of my favorites, the delicious fruit spreads and the homemade Macadamia nut coffee cake. Visitor information: The Shipman House is located at 131 Ka`iulani Street. Rooms start at $219 per night with a two-night minimum. The Vietnam Memorial wall lists the names of the Hawaiians who gave their lives in service during the Vietnam War. Visitor information: Turn onto Pauahi Street from Kamehameha Ave., then left onto Piopio Street. Park at the end of Piopio Street. With gleaming gold adornments contrasted against dark black, you’ll notice right away that this impressive statue was built for royalty. 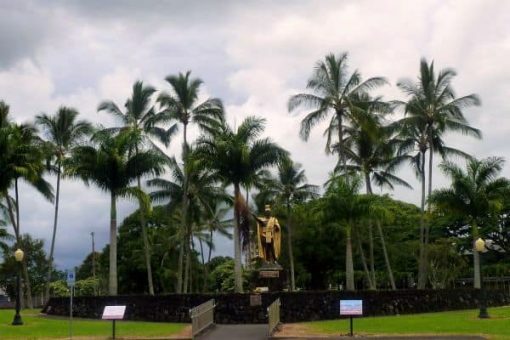 Located near Wailoa Pond, the statue honors King Kamehameha I, the first chief to unite the Hawaiian islands (in photo at top). Locals often leave flowers and other small offerings at the statue. Visitor information: Turn off of Kamehameha Avenue onto a small street just before (or after, depending on your direction) Pauahi Street. This statue is almost impossible to miss if you drive into Hilo from the aiport. Known as the Hilo “Walk of Fame,” these trees have withstood major tsunamis and continue to be an impressive sight, whether you are driving or walking. It’s fun to read the wooden plaques by each tree to see who planted it – look for Amelia Earhart, Babe Ruth, Franklin D. Roosevelt, Richard Nixon, Cecil B. DeMille, and more. Visitor information: Banyan Drive is a horseshoe-shaped road off of Kamehameha Avenue that goes out along Hilo Bay. 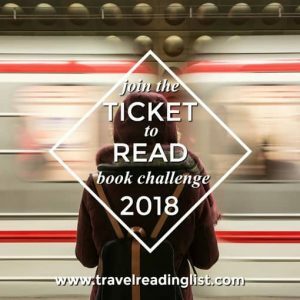 Note: The author’s visit to Hilo was sponsored and paid for by the Big Island Visitors Bureau; the opinions expressed herein are solely those of the author.